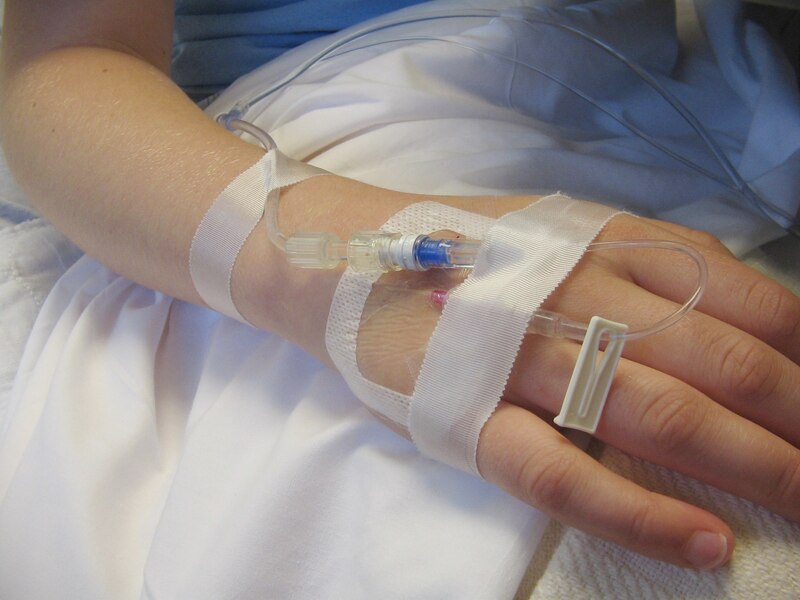 High calorie intravenous nutrition (total parenteral nutrition or TPN) is the only option for feeding if a patient’s gastrointestinal tract is not functioning. It consists of a potent mix of nutrients used for patients who need long term nutritional therapy. Its primary role is delivery nutrients, and not medications. Heparin, regular insulin, and a few other medications are safe to add to the solution. TPN is delivered either into a large vein in the arm or into a large vein in the chest. The basilic or cephalic vein is used in the arm. The subclavian or jugular veins are used with a temporary central venous access device. Longer term use of TPN can be accomplished by creating a tunnel under the skin of the chest, or implanting a port in the chest. The lungs may be pierced by the needle used to pierce the subclavian vein, causing the lung to collapse. An artery may be accidentally hit by the needle. The standard of care requires obtaining a chest x-ray to verify correct placement of the central venous access device to ensure the line was correctly placed. The risk of a deep venous thrombosis related to the catheter is minimized by making sure the tip of the IV line is located lost to the right atrium. Total parenteral nutrition has a high sugar content. It is a perfect breeding ground for bacteria. Contamination of the solution, dressing, or tubing can result in a serious blood stream infection. This may be heralded by shaking chills, increased white blood cell count, fever, or unexplained rise in blood sugar. Ideally the tube is removed and placed in a new spot while antibiotics treat the infection. Blood sugar can be difficult to control while the patient receives TPN. Untreated or difficult to control hyperglycemia causes increased illness and death. The standard of care requires close monitoring and swift intervention to decrease the risk of infection and improve patient outcomes. The care providers will supply insulin in various combinations and types to maintain blood sugar under 150 mg/dl for critically ill patients and under 180 mg/dl for less ill patients. Refeeding syndrome is a risk for patients on TPN. It is a series of dangerous electrolyte abnormalities and fluid shifts when TPN is begun. This can result in decreased electrolyte levels in the blood. The patient may be fatigued, lethargic, weak, have cardiac abnormalities and may ultimately die if left untreated. The standard of care requires careful monitoring of electrolytes and slowly starting TPN.